Kawah Ijen on the east coast of Java is one of a complex of volcanoes, overlooking a turquoise lake full of hydrochloric acid and the location of the phenomenon “Blue Flame”. This is actually the sulphuric gases igniting on contact with the air as they seep through the cracks in the rock. This can seem like it is flowing as blue lava, and is beautiful to watch. We had to rise at 1am to hike for 90 minutes up the side of the volcano, followed by a 45 minute hike down into the crater to get close to the spectacle. While we were photographing the fire, the wind turned, engulfing us in a cloud of gases, burning our lungs and stinging our eyes. We couldn’t run up the path fast enough to escape, but without realising it we had run most of the way back up the path to the top of the crater! Miners work tirelessly to extract the sulphur and carry out loads of up to 90 kgs in their shoulder baskets. It is unbelievable that these men enter the toxic environment on a daily basis, with only a handkerchief for protection, all for a measly 700 Rp per kg (about £3 for a 90kg load). We saw a constant stream of them making their way up and down the path, some offering to sell little figures made of sulphur to tourists, and somehow always with a smile. This entry was posted on 25/07/2014 by Lisa. 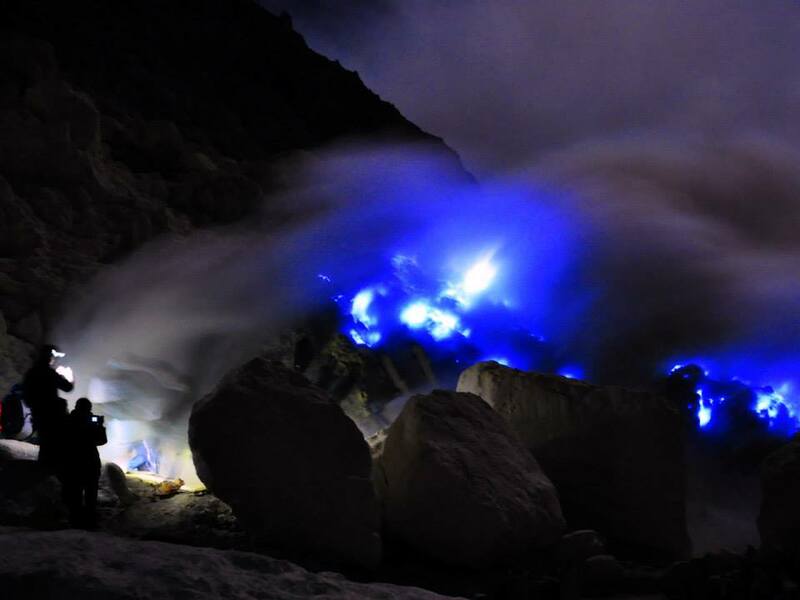 It was filed under Photo of The Week and was tagged with blue fire, blue flame, crater, Ijen, Indonesia, Java, Kawah Ijen, sulphur, sulphur mine, volcano.